U.S. Rep. Joyce Beatty, the Central Ohio Transit Authority and The Ohio State University presented Ohio’s 14th Annual Statewide Tribute to Rosa Parks, “The Power of One,” on Monday, Dec. 3 at the Fawcett Event Center, and Tuesday, Dec. 4 at the Southern Theatre. A record 500-plus attendees celebrated “The Power of One,” at the Community Leaders Forum on Monday evening and heard remarks from Joanna Pinkerton, President/CEO of COTA; Dr. Michael Drake, President, The Ohio State University; Columbus Mayor Andrew Ginther, and Congresswoman Joyce Beatty, U.S. Representative for Ohio’s 3rd Congressional District. Author Andrea Davis Pinkney, from left, Congresswoman Joyce Beatty, Mayor Andrew Ginther, COTA CEO Joanna Pinkerton and Ohio State University President Micheal Drake celebrate the renaming of North High Street between Broad and Gay streets as Rosa Parks Way. 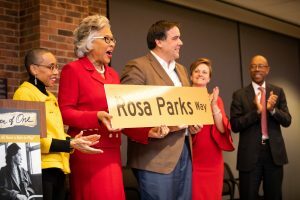 During his remarks, Mayor Ginther announced the city will name North High Street between Broad and Gay streets “Rosa Parks Way” in recognition of Parks’ courage and transformative action. A studio audience participated in a panel discussion titled “Footsteps: We All Have a Role to Play.” The panel featured Hasan Jeffries, Associate Professor of History, The Ohio State University; Ginette Rhodes, student and President of The Ohio State University Chapter of the National Association for the Advancement of Colored People; and New York Times best-selling author Andrea Davis Pinkney. The panelists discussed Parks’ life as an activist, how small actions can lead to big change, the next generation of civil rights activists, and what steps everyone can take to safeguard equality. WBNS 10TV news anchor Jerry Revish moderated the discussion, and WOSU-TV recorded the panel discussion to be included in their Columbus Collaborative Series. The annual Children’s Assembly on Dec. 4 at the Southern Theatre featured the Columbus Children’s Theatre’s production of “The Ruby Bridges Story,” a play by William Goldsmith. Jerry Revish served as Master of Ceremonies. More than 600 students attended from Alpine Elementary School, Easthaven Elementary School and Hamilton Local Elementary. WBNS 10TV live streamed the assembly. Ohio was the first state to designate Dec. 1 as Rosa Parks Day to honor her life and legacy as the mother of the modern civil rights movement. In 2005, then-State Representative Joyce Beatty wrote, advocated and won unanimous support to pass Ohio’s legislation in the 50th anniversary year of Mrs. Parks’ courageous act. In refusing to give up her seat on a Montgomery, Alabama, bus to a white passenger, she sparked the Montgomery Bus Boycott and the modern civil rights movement. WBNS-10TV served as the media sponsor of the 14th Annual Statewide Tribute to Rosa Parks.